Stir in the coleslaw mix, water chestnuts, onions, soy sauce, hoisin sauce, garlic and ginger. Saute until cabbage starts to wilt, but is not mushy. Position an egg roll wrapper with one point toward you. Place about ¼ cup filling in the center. Fold bottom corner over filling and tuck under filling. Gently fold the sides toward center and over the filling. Roll toward the remaining point. Moisten top corner and any other "loose areas" with beaten egg yolk and press to seal. Heat deep fat fryer (or oil in a heavy skillet) to 375. 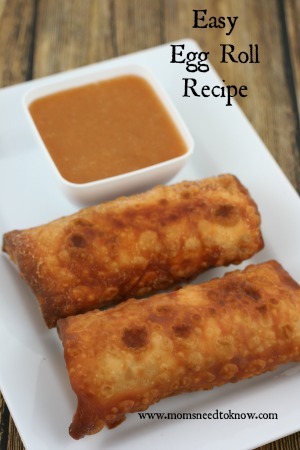 Fry egg rolls, a few at a time, for 1-2 minutes on each side or until golden brown.